Vision's full-scale single-hand rod series Onki really nailed it. Since the launch in 2016 it has been a real success in every possible way. Now their mission is to do the same with new ONKI DH and ONKI SWITCH rods. The quality of high-modulus Korean graphite (40tn) is something you normally find only in more expensive rods and it enabled us to create very light yet powerfull rods. The rest of the components are of great quality as well. These rods are in a great price range and when compared to our proven TOOL Double handed rods they have a bit softer action, especially in the case of SWITCH rods. LOOP's new OPTI NXT series is a dynamic range of fly rods designed specifically for modern double-handed casting techniques. Throughout the spectrum of fishing styles, these rods excel in all disciplines of modern fly casting from compact skagit techniques to long line traditional speycasting. The series is designed for a range of applications from hunting deep glides for gnarly winter steelhead to swinging dry flies for Atlantic salmon.  Triangular black colored with glossy finish reel-seat. Presented in pearlised grey, these Medium Fast Switch Rods are designed for freshwater fishing and finished using the highest AAA grade cork, Loop's unique triangular reel seat, hard chrome snake guides and ultra performance carbon fibre. The CAST Medium Fast rods allow you to fish all day with maximum performance and minimum fatigue. The new CHROMER rod series provide the ultimate tool for the two-handed angler. With refined rod actions to suit a variety of casting and line styles, the rods also feature custom polymer gripping sections on the top and bottom handles. These unique pinch grip sections allow for easy running line management during spey casts and added comfort over a long day of fishing. With both switch and spey models, Redington offer a size for just about any salmon or steelhead fishing scenario.  Downlocking reel seat for improved in-hand balance.  Polymer Pinch Grip sections on top and bottom handles.  Polymer grips maintain body temperature for comfortable winter fishing.  Matte finish blank for flash reduction.  Section tips epoxy coated to prevent sticking.  Full Anodised aluminium reel seat.  Premium grade cork handles.  Fully protective cordura rod tube with dividers. 10% Discount on fishing tackle orders over £500.00 net & 12% discount over £800.00 net. Redington Prospector Fly Rods, An entire series of salmon rods dedicated to the two-handed fly caster. Three Prospector spey models and three Prospector switch rods. 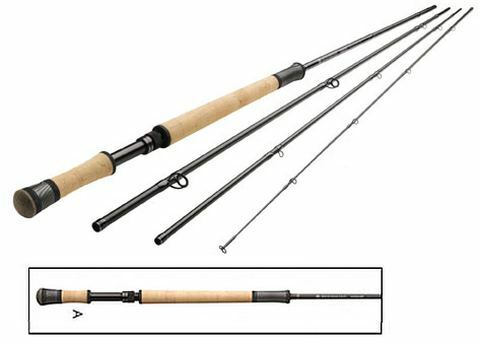  Two-handed Redington rod series with offerings in both heavy and lighter weights.  Suggested line grain weights are included on all rod decals.  Custom cork handles with composite cork trim.  Satin black reel seat.  Durable black cordura rod tube. LOOP CROSS S1 SWITCH FLY RODS AVAILABLE BOTH ONLINE AND IN OUR UK SHOP. Many customers are now using these rods for estuary and saltwater fly fishing. They are so light you can use it all day! Over a period of two years Loop have developed these versatile salmon, seatrout and saltwater rods using the new 3M Powerlux Composites. The result is amazing, the strength associated with the 3M Powerlux Composites generates a lightness and controllable elasticity that just must be experienced. The Vision Switch and Switch & Salt Fly Rods are extremely versatile, no matter if you fish on rivers or at the sea. With Vision Switch rods you have the benefits of casting as with a double hand rod but can work the fly like a single hand rod, a real benefit in many fishing situations. These rods with modern shooting heads give you an opportunity to fish certain places much more efficiently compared with fishing them with long double hand rods or normal single handed rods. Can you imagine yourself wading deep, in a steep canyon with overhanging trees behind you and trying to launch a cast of 30 metres? Of course its possible with other types of rods too, but with Switch rods you can make it so much easier! These rods are getting more and more popular in coastal fishing too and they are really handy on bigger trout rivers. With Switch & Salt there are two models which are designed mainly with saltwater boat fishing in mind. These rods offer huge lifting power so you will be able to pump huge tuna up to the surface with ease. The rods from #6 to #8 have nice wood insert reel seats and their other components are also chosen with river fishing in mind whereas the #10 and #12 a have full aluminium reel seat, a slightly differently shaped handle and other components suiting heavy saltwater fishing.